What is Cholesterol and Why is the Current Standard Thinking Wrong? Even doctors sometimes give an incorrect answer to the question, “What is cholesterol?” by making the common assumption that cholesterol is a type of fat. But cholesterol is not a fat. The word cholesterol comes from the Greek words chole (meaning bile) and stereos (meaning solid) and is followed by the chemical suffix -ol for alcohol. Cholesterol is not inherently bad, especially when you consider that most cholesterol inside of us is manufactured by our bodies and is necessary to create bile acids, cell membranes, vitamin D, and steroid hormones and to perform other vital tasks. Indeed, cholesterol is essential for life in all humans and other living creatures. It is synthesized from simpler molecules in a complex 37-step process. Your body manufactures about 20-25% of the cholesterol it needs in the liver, the bulk of the rest is produced in your intestines, adrenal glands, and reproductive organs, and small amounts are made by individual cells throughout your body. The typical 150 pound person makes about 1 gram (1,000 mg) per day, and eats about another 200-300 mg. Most of the ingested cholesterol is in a form called an ester, and this type (esterified cholesterol) is poorly absorbed. Besides, your body compensates for absorption of dietary cholesterol by reducing cholesterol synthesis. 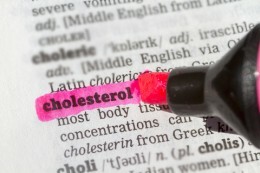 So, what is cholesterol from food doing to your body’s level of total cholesterol? Very little. The total amount contained in the body is about 35 grams, primarily located within all the membranes of all the body’s cells. What is cholesterol doing in the body? Unlike fat, cholesterol is not primarily used as fuel for energy. It is used for building and maintaining membranes of cells—for their structure, permeability, and fluidity—so that other molecules and fluids can move in and out, for instance. Cholesterol is also contained inside cells for the biosynthesis of steroid hormones, such as testosterone, estrogen, progesterone, and cortisol. It is also used to make vitamin D and bile for the digestion of fats. In addition, it contributes to the development and working of the central nervous system, and it has major functions in cell signaling and sperm development. What is cholesterol transport and why is it important for heart health? 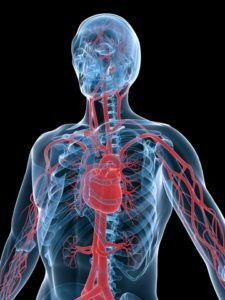 In order to move around the body to reach its destinations, cholesterol travels in blood. However, since the blood is mainly water and cholesterol, like fat, doesn’t mix in water, it travels within little packages called lipoproteins. Lipoproteins are complex particles with water-soluble exteriors composed of mainly of proteins and lipid-soluble interiors for carrying fats and cholesterol. The protein part of the lipoprotein is like a molecular address that determines the start- and endpoints for cholesterol. Will the lipoprotein particle get taken up by the wall of the artery and set the stage for plaques to form? The answer to this depends on the type of lipoprotein, which is determined by its size, density, and protein types (apolipoproteins) incorporated within it. What is cholesterol theory and why is the current theory wrong? The standard thinking, based on decades-old theory, is that LDL (low density lipoprotein) is “bad” because it leads to a buildup of cholesterol in your arteries and HDL (high density lipoprotein) is “good” because it carries cholesterol from other parts of your body back to your liver. The goal, therefore, is to keep your total cholesterol and LDL low and your HDL high. What is cholesterol theory – s based on decades-old, outdated information – still doing in today’s medical system? That’s a question too complex to answer here. It’s true that this older theory, which has never been revised by the major medical groups, was the best way to explain what was known about cholesterol and cardiovascular disease at the time. However, the theory is based on assumptions that have since been proven untrue. If you are less interested in answers to “What is cholesterol?” and more interested in natural treatment strategies for cholesterol-related issues, see our comprehensive guide to Natural Cholesterol Control. You’ll learn how to improve the newer, more important major risk factors for heart disease, many of which are related to cholesterol, such as oxidative stress and inflammation. Houston MC. What your doctor may not tell you about heart disease. Grand Central Life & Style; Original edition (February 6, 2012). alcohol, cardiovascular, cardiovascular disease, central nervous system, cholesterol, cholesterol control, cortisol, digestion, estrogen, food, hdl, health, heart disease, heart health, high density lipoprotein, inflammation, ldl, lipoprotein, low density lipoprotein, natural cholesterol, natural cholesterol control, natural treatment, oxidative stress, protein, reducing cholesterol, stress, testosterone, total cholesterol, vitamin, vitamin d, water and cholesterol, what is cholesterol. I thought you might be interested in this article on https://universityhealthnews.com: What Is Cholesterol and Why Is the Current Standard Thinking Wrong?